This healthy conversation was conducted with Veronika Banaśová, one of my yoga mentors from Brno, Czech Republic. She’s a teacher at Pure Yoga Studio – a place that I adored no just because the yoga practice, but for the community itself. My message that come along with this interview is : dare to discover your yoga teachers beyond the good-looking postures; they are infinite sources of inspiration for all of us. When did yoga come into your life and how did you become a teacher? I started yoga in 2011 when I was searching for some relaxation and stretching exercises during final exams preparation at University. I was practicing for a while following some videos on YouTube mainly from Tara Stiles. After about one year, I started looking for a guided and more intensive experience so I started hot yoga lessons in one local studio in Brno. I really enjoyed hot yoga at that time having my first and the best body detoxification. After this, I started being more and more interested in nutrition too because I realized that food had a huge influence on my yoga practice. My next natural step from hot yoga was, actually, a step back. I decided to go back to the traditional way and study the Vinyasa practice. But, honestly, for me yoga is one and the same thing no matter the style. I was more driven by teachers rather than different practices. I am always eager for more information so, I have decided to signed up for a teacher course in 2017 and now I’m officially a yoga instructor. Yay! Have you been in a long-term relationship with sports in general? I have always enjoyed the active life. Although there were periods in my life when I was so lazy … especially during the collage. But I’m grateful because I learned a lot from that inactive and less healthy part of my life. At high school I was doing athletics for a while and I really enjoyed it but after some time I realized that I didn’t like the competitive spirit in general. Thus I have found the solution after few years in yoga. Even in yoga people are sometimes trying to compare themselves with someone else which is in the human nature, I guess. but the main purpose is about our inner “competition”. What’s your best yoga experience? I’m continuously enjoying this yoga teaching experience. Every lesson is different and I am so grateful that I am constantly reciving the best rewards = people coming back to my classes. What means the word ‘yoga’ for you? Yoga for me is about a positive approach in life that emables us to live the life to the fullest and take advantage from every opportunity. It is about building respect towards our body and thanks to this, it enables us to know our bodies better. I like the way yoga is giving me stability and courage in my life. It is kind of self-therapy that keeps me balanced, so that for me it is a never ending process of learning. What are your favorite and most challenging yoga poses? 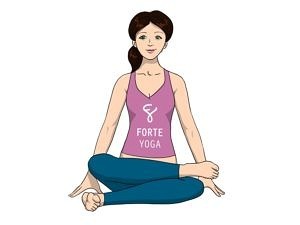 My favorite poses are the ones in which I can be stable, relaxed and that ones where the breath is flowing freely through my body. I think that I will work all my life with my stiff hips so all poses for deeper opening hips are big challenges for me. For example Fire log pose – Agnisthambasana or Lotus pose – Padmasana (img). I love so much your yoga playlist. Would you share some songs with us, please? Yes! I love music so much. Maok, is a great music for relaxation. I discovered him this summer when he had a beautiful concert on Healing festival in Brno and, btw, I highly recommend this kind of live healing experience to anybody! They are extremely peaceful and they offer long-term positive energy. Regarding the music at my classes, I use to create my playlists on Spotify. Here is a link for my recent playlist. If you are not familiar with this app, you don’t need to have a paid version but you will have to create an free account and it will play a random list. What are the yoga books you recommend us to read? I really enjoyed The Dalai Lama’s Cat by David Michie which a dear friend of mine offered me. A good book for the deeper understanding of vinyasa yoga in English is Heart of Yoga by Desikachar. Another great inspiration form me (available only in Czech) is the book called Kuchařka podle jógy from Bettina Matthaei and Anna Trokes. Now I’m reading Marie Kondo’s well-known The Life-Changing Magic of Tidying Up and I’ve already started to apply some tricks from this book in my daily life. What are the blogs / websites you follow? Working by the beach in Al's van, with ocean breaks and giant pizza slices from Wild Bakery. My kind of workday. ??? If you’re invited to write a message on a billboard in Brno what would you write/paint on it? 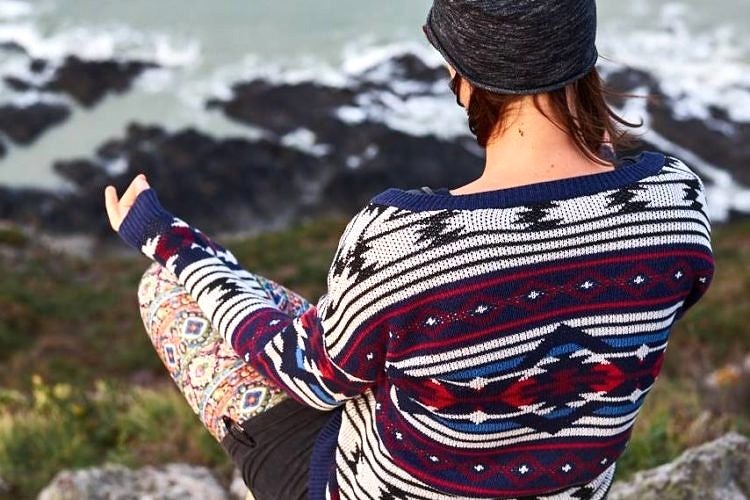 Dear Veronika, thank you so much for sharing with us your yogi story. I wish you all the best on your life journey… Ah, and please keep sharing with us your beautiful stories on Instagram. Veronika is also a wedding photographer, a subtle and delicate one. She shares this artsy passion with her husband and here you can see their beautiful portfolio: www.subtleart.cz .